Grass cutting (or usually to be more accurate, the lack of grass cutting) is often a thorny issue. 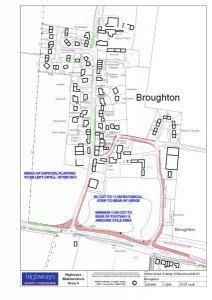 In 2004 a new grass cutting plan was drawn up with North Yorkshire County Council which increased the amount of grass cutting within Broughton itself. There was also a new scheme for the footpath alongside the B1257 between Broughton and Malton. Thanks to those who took part in the surveys held in Broughton, Swinton and Amotherby asking for views on the state of this path, together with the thoughts expressed by those attending a public meeting at Ryedale House, one issue causing concern was the state of the vegetation which was interfering with the safe passage of those using the footpath. At the meeting was Richard Marr, Highways No 4 Area Manager. He agreed to look into this particular aspect which resulted in the new scheme to keep the vegetation cut back alongside this path all the way to Malton. Please see the map below to check the grass cutting areas within the village itself. Those sections marked in green are areas where it should be possible to cut using a lawnmower whereas the areas in red are those stretches which need the use of strimmer. The other maps are on a second page linked from here. An enlarged version of each map can be seen by clicking on the map and then clicking on the map again when it appears on a new page. Issues relating to the grass cutting can be taken up with North Yorkshire County Council via email at area4kirbymisperton@northyorks.gov.uk or via the NYCC website. Map showing grass cutting plan – green for areas which can be cut by lawnmower, red for those areas which need cutting with a strimmer.